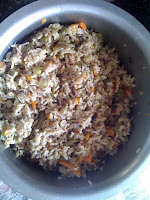 Pulav also spelt as Pulao or Pilaf is a fragrant rice dish. This dish is not particular to one region in the world. Seems like it has its origin in the Middle east and may have been popularised in India by people visiting from there. Today it is a common fare dish in Northern India and exceedingly becoming the "something different" special fare dish in Southern India as well. My house has a tradition of Pulav most Sundays because sundays are special requiring a special lunch! My mom is one of the best makers of pulav and she never has to contend with left-overs when she makes it. I have followed her footsteps and recipe and at the risk of sounding immodest, am becoming very good and confident at making Pulav too. Yesterday I made it again for T and family and it was delicious (with only one last minute refer-back to the recipe). One has to remember that dishes which use spices can taste different from one cook to another simply because the spices are all so unique. You add a little more of cinnamon then it tastes different from when you add a little more of the masala flower! Slit the beans lengthwise and then cut them breadhtwise into 1 inch length pieces. Cut the onions into half. Slit each half lengthwise and then make thin slices breadthwise. Grate the coconut. Alternately if you dont want to use coconut then soak 3 tsp of rice for around 15 mins till it becomes soft and breakable. Grind all the spices into a paste along with the coconut/soaked rice. Wash the rice and keep it ready. Take a pressure cooker and place it on a lighted stove. Add the oil into this and allow it to heat up. Put the onions in and sautee till it becomes golden brown. Now put in the beans, carrots and peas and sautee all this for 5 minutes. It would help to not keep the flame too high. Put in the rice and allow it fry for 5 minutes. Now add the spices paste to this and mix thoroughly. Add in the water at this point. Nows the time to add salt as well. Allow the whole thing to boil for sometime. When it comes to a boil, you can check if the salt is ok and then close the lid of the pressure cooker. Allow it to cook on steam. The bay leaf need not be ground into a paste. You can just put it in as a whole after the spices are added in the cooker. This will give an aromatic smell. But take care not to eat it! This quantity will easily serve 4 people. Reduce the quantity of each spice if you think you cannot handle the spice.